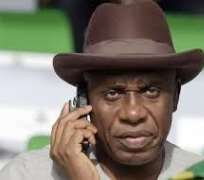 Another audio clip of Rotimi Amaechi, Director-General of President Muhammadu Buhari’s campaign organisation, has leaked with the embattled Minister of Transport heard describing Lagos as a ‘glorified village’. According to the trending audio clip, Amaechi said there was very little infrastructure in Lagos, especially water and roads, while lamenting the spate of traffic jams in the state. The Minister’s purported rants subtly indicts the All Progressives Congress (APC) which has controlled Lagos for 20 years through AD, AC, and ACN; the Co-chair of President Buhari’s Campaign Council, Asiwaju Bola Tinubu; fellow cabinet minister, Babatunde Fashola; both of who governed the state for 16 years combined. Amaechi “I live in Abuja, tell me where else we have infrastructure. Lagos is a glorified village. The only difference between Lagos and other cities is the fact that business is in Lagos, everybody is there doing business, so you can at least have food,” he said in the New audio clip.